"Official Home of the Dual Mack Attack!" Freeport VFD is a 100% volunteer department that has been proudly providing fire and rescue services to the Borough of Freeport and its surrounding communities since 1916. We are the primary fire and rescue company of Freeport Borough, and we respond simultaneously with South Buffalo Township VFC on most calls in Freeport Borough and South Buffalo Township. 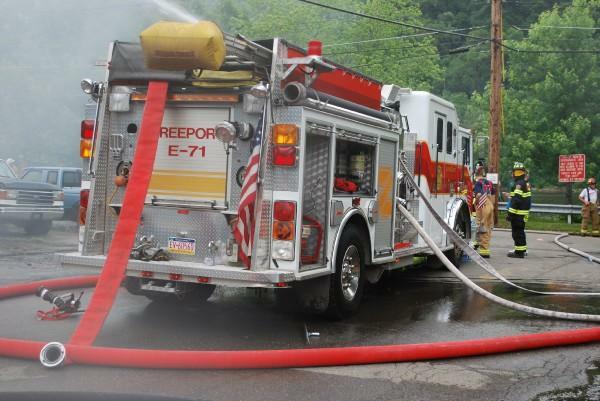 We also respond on the first alarm into parts of Buffalo Township and Allegheny Township. In 2009 due to the increased amount of rescue calls, the department bought a used light rescue truck from Pioneer Hose Co. to hold the rescue equipment previously stored on Engine 70-1, along with some new equipment bought with various grants. Rescue Company 70 currently has 16 volunteers certified as Basic Vehicle Rescue Technicians. Today, the services we provide include, but is not limited to: fire prevention, fire suppression, rope rescue, vehicle rescue, river rescue, pumping details, pre-planning, traffic control and support to Freeport EMS. We serve our community with two fully equipped engines, a light rescue truck, a squad, and a boat. We also have our own fire police which responds to incidents to help with traffic control. Chief 1: Tom Sweeny Jr.